Amethyst, due to its beauty, affordability and durability, is the most popular variety of the mineral, quartz. Most gemstones, including diamond, need enhancement through cutting or treatment to be enjoyed in a piece of jewelry. Occasionally, Amethyst is heated to permanently purify its purple hue. Cherished for its beauty, affordability and durability, Amethyst is an excellent choice for everyday wear, yet remove it before activities which may cause scratches. With proper care, your Amethyst jewelry can be passed through generations. While today we are not limited by tradition, the symbolism of Amethyst is treasured as the birthstone for February and the traditional gift for couples celebrating their sixth anniversary. 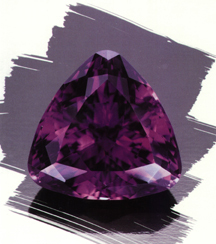 The color of Amethyst has long been associated with passion and hope.